International Journal of Research in Health Sciences,2015,3,1,158-164. 1-Associate Professor, Department of Medicine, RIMS, Raichur, Karnataka. 2,3,4,5-Assistant Professor, Department of Medicine, RIMS, Raichur, Karnataka. 6-Associate Professor, Department of Biochemistry, GIMS, Gadag, Karnataka. 7-Professor, Department of Biochemistry, RIMS, Raichur, Karnataka, INDIA. Cirrhosis is a diffuse hepatic process characterized by fibrosis and the conversion of normal hepatic architecture into structurally abnormal nodules. Cirrhosis represents the last histological picture for a large variety of liver diseases. The progression to cirrhosis is very uncertain and may occur over short time (weeks) to long time (many years). The liver and the renal systems are physiologically as well as pathologically interlinked. 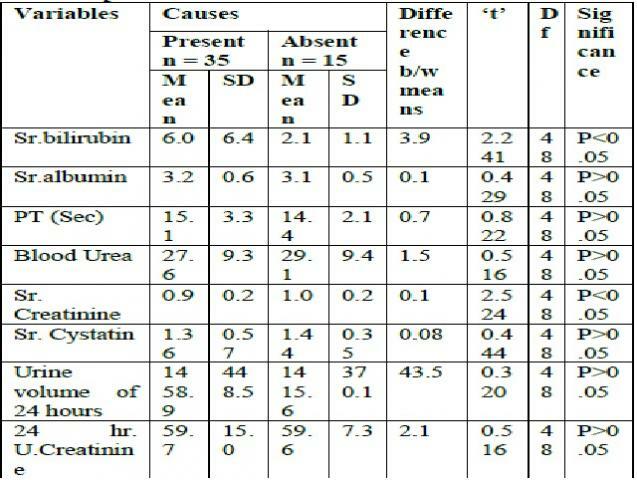 Hence a detailed study was undertaken to study the renal parameters in cirrhosis of liver,the focus is done to evaluate the diagnostic accuracy of plasma creatinine and creatinine based formulas in assessing renal functions in patients with chronic liver disease and to assess the diagnostic accuracy of cystatin C and cystatin C based equations in assessing renal functions in chronic liver disease patients and finally to proove whether etiology of chronic liver disease has an impact on renal function in these patients.